Want to know what winters biggest hair trends have been? Yes we are confident in saying these styles will be sticking around for spring. So if you’ve missed these trends as of late, theres still plenty of time to recreate these looks in the upcoming months. The 90’s are having a throwback in a big way and we couldn’t be happier. After seeing scrunches make an appearance on the catwalk, including Chanel’s fall runway show, this retro style has made its comeback. 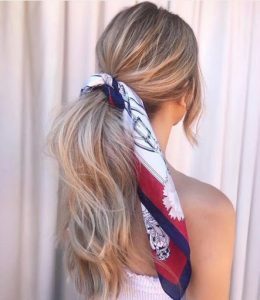 Scrunchies give the illusion of hair being bigger, more volume, texture, is super gentle on our hair and doesn’t leave pony tail indentation marks WINNING!! With modern day scrunchies designs coming out in all different shades of pastels, colours, materials and patterns, its easy to accessories with any outfit. 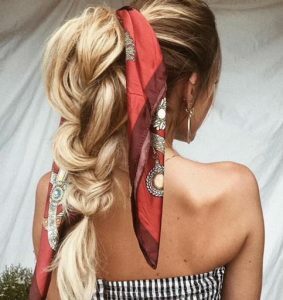 Its all about the hair accessories at the moment, with head scarfs becoming an on trend accessory. Wrapped around a pony tail or even incorporated into a braid – this look will go with anything. The silk scarfs with bright coloured patterns is a great way to brighten up any hair color or add dimension to a style. Scarfs will also be a modern twist to this years racing season, mixing it up from the hats and fascinators. When we see it on Chloe Kardashian, who isn’t going to want to get amongst it? 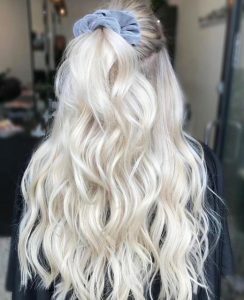 Adding extensions to give your hair that extra length and volume with this look is also great. 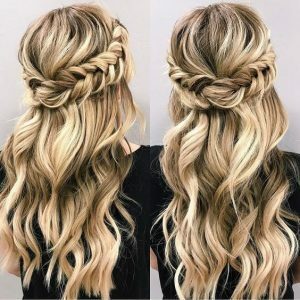 Team the half up, half down with some textured curls for a party or tighter waves for a formal look, this style is great for those who like having their hair down as a security blanket but want it out of their face. You can even leave hair out around your face to soften it and even accessorise with a scrunchie. We love this this super versatile look. If your wanting to try any of these styles for your next do, give the Team at Meraki a call on 51747601.